Solovki Company Plunge into history with comfort ! 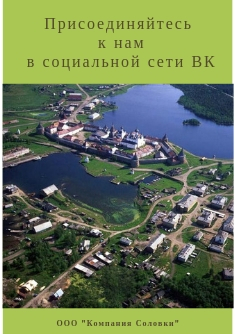 Tourist Hotel Complex «Solovki» is situated in a green area one and a half km from the settlement of Solovetsky, on a picturesque bank of the Varazhskoye Lake. Five cottages are for guests, they have 49 rooms for 116 persons. The Tourist Complex has its own well equipped area, a cafe refectory and a hall where an open fire burns. Meals are three times a day, dishes are all home-made. The Complex comprises two one-storey cottag­es; You can rent bicycles, braziers, fishing and tourist equipment; and excursions can be booked. You will never want to come back to the world of concrete houses. iron roofs and asphalt streets! Copyright © 2001—2013 LLC "Solovki Company"